When the television forecast looks like the one above, the local paper’s weather blog is posting scenarios where even the best case doesn’t sound so great, and the looming weather event has already been named “Frankenstorm,” I gotta say — the impulse to panic is strong. But I’m a Northeastern girl at heart and as such, just find it hard to get all that worked about storms. (Not having kids who will get all stir-crazy if stuck inside during a power outage makes it easier not to worry, I’ll admit.) There are things I do need to do to get ready, though, like bring in my plants from outside and get some new batteries for my flashlight. This time, there’s the added wrinkle that I am supposed to be heading out of town on Wednesday, which should be at least a day after the storm passes, but could be a mess of power outages, delays, etc. And there are few things I hate like fussing around at the airport — so stressful. I’ll cross that bridge when I get to it, however, and instead spend the weekend doing the prep that is within my control, like laundry and packing and such, along with getting ready for the storm. Wish me — and everyone else in the storm’s path — luck, as well as our conference planners, who are a little concerned that their east coast based speakers and attendees might not make it to Spokane. 1. Fill your bath tub, or a large trash can with water (to flush toilets). 9. Buy a box of baby wipes, hand sanitizer, and facial wipes – if you’re water goes out (or your hot water for showers) these are your friends! 11. Have your hiking boots (or other strong soled shoes) handy for the aftermath. 16. For your friends with cars, fill up the gas tank now, and top it off before the storm – in all your cars. Just a little reminder for anyone who has gotten this far and thinks I’m nuts. We were without power for 10 days after Ike. Oh, don’t be surprised if your gas hot water heater has an electric trip switch on the pilot light. Ours did. Ug! Good luck to all. Here’s hoping this is all Franken-hype! – stock up on band aids, alcohol wipes, ace bandage, gauze, neosporin, etc. for your emergency kit. Excellent list, E. One add: stay away from windows and patio doors; flying roof tiles. Stay safe loved ones. Hugs. Been prepping all day here myself — including cleaning leaves from the sewer catch basin next door. The Mayor asked residents to do that as the leaves are falling at an alarming rate — Mother Nature knows — and work crews cannot keep up with the task — and neighbor not home, sooooo. 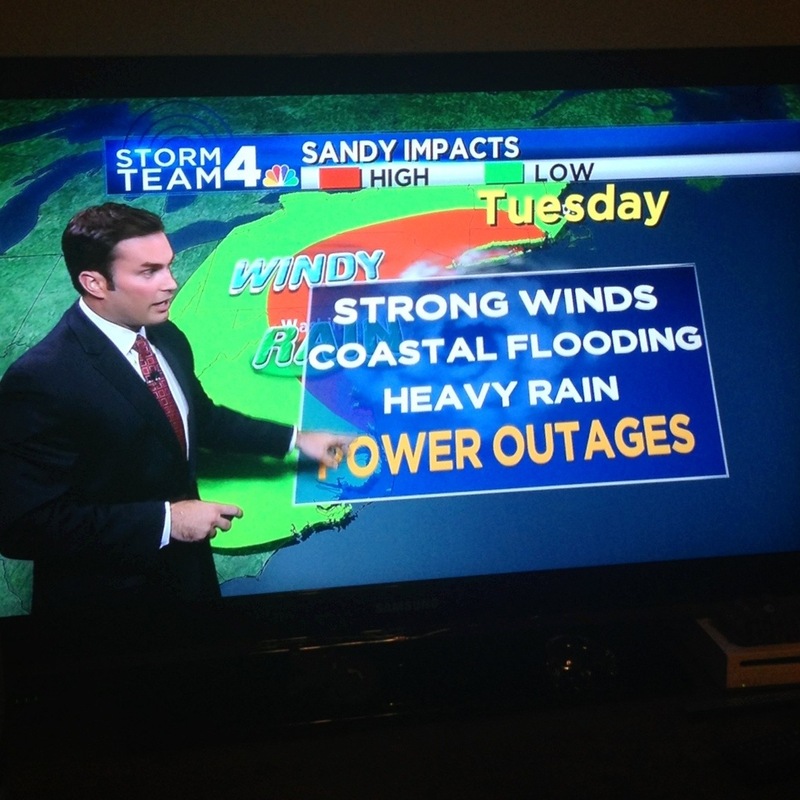 It looks like the biggest issue for the Binghamton part of NYS is going to be flooding and/or power outages. Oh, and another item for Eileen’s great list is CASH MONEY! Just in case you get the opportunity to buy something, no power renders ATMs and credit cards useless! sigh. I meant to get gas and cash today, and forgot. Ugh. I also went out today (Sunday) and purchased a digital, lithium battery back-up radio. Don’t have a radio in the house. How’d that happen? Anyway, also got two extra batteries for it. It self-sets to best station and time, date, etc. Timex — $20 @ Bed Bath & Beyond. Back-up batteries cost as much as the radio. sigh…. Also, finished the laundry and then filled the top-loading washer with cold water. Just as an extra. Our municipal sewage treatment plant collapsed in last year’s storm and is yet to be fully repaired and operational, so I’m just being a bit proactive here. HOPE THIS IS ALL FOR NAUGHT!! Stay safe all! Special hugs.